So now I'm all done with the road tripping part of my Summer (sadly) I will get back to doing some slightly less exciting VFTP's. There was some fun stuff happening though, and I can't say that I didn't enjoy the racing! The installment is written from my bed, having been to the doctors today it turns out that I'm just being soft and all I have is a cold. So essentially I need to either rest or man up. So rest it is. 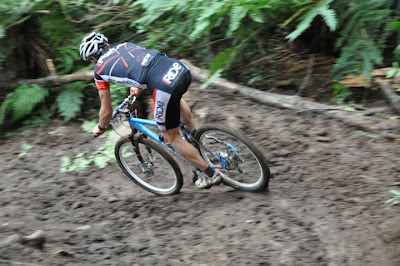 I haven't actually ridden any singletrack since I got back to Wellington which is quite sad, and beyond that I have only ridden on the road once and raced Karapoti. I feel very slack, but do not have the energy to get on a bike at all at the moment. I am however looking forward to getting back to racing. Seeing the results from the recent BUCS (British University and Collegiate Sports) XC champs has got me wishing I was there. It's always such a great event, and with Tom Bell (of Leeds University and newly qualified Elite racer) taking it out from John Whittington I think I could have been up there (with a little speed work that is). We could have had a Leeds 1-2, which would probably have guaranteed us the team gold instead of the silver. It's good that the boys kept up the record though, hopefully I can take the win next year! What that little ramble was trying to say is I miss racing already, and with my time in bed I have been planning how to get fast, it will involve some investments (turbo-trainer and gym membership) but it will be worth it. So, the VFTP (View From The Pack) for Dunners. I was staying with family (Nigel, Tracy, Marc, Gabriella and Robbie) in Mosgiel about 20km out from the city. It was really nice to have somewhere to relax with the comforts of Internet, TV and family, although I didn't take advantage of it every night. I also have to thank Tanya for feeding me and putting me up for a night, for sorting me out with contact lenses, keeping me smiling and generally being good fun! Also thanks to Em and her housemates for not getting to annoyed at me crashing on their couch. My first pre-ride of the course was on the Wednesday having arrived in Dunedin on the Monday. Tuesday was spent buying jeans and worrying about the boys in Christchurch mostly. Some of the course was on private land (the first climb) which meant that my pre-ride missed out the first climb and descent, but I was assured that there wasn't anything overly technical and challenging in that section, and besides I would get to ride it the day before the race anyway. So the first technical challenge I cam across was THE technical challenge of the race (which was later to be taken out, then put back into the course). This involved a reasonably steep (but easy enough in 1-1 ratio) but very slippery climb with a few switchbacks at the bottom followed by roots on some of the upper straight sections and rocks right at the top. 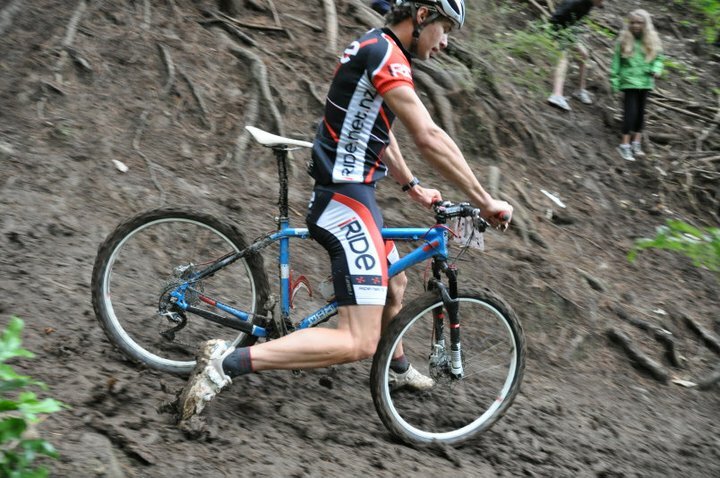 This was to get very cut up by the time we raced; the rain combined with lots of riders made it close to unridable at times, and I only cleaned the whole climb once in the race, invariably running the same section. This climb turned into a very nice descent which opened with a slightly off camber traverse to the first 180 degree right which had a large rut most of the way through, but just didn't carry on quite far enough to spit riders out in the best line for the next long left hander. I managed to ride this once on the first practice run and was the deciding factor in buying some new Medusa 2.1's which stood me well for the race allowing me to ride this section every time save once when I got over ambitious trying to overtake a tail end woman (who road the whole descent clean and better than most of the men). My line was wide and then some, making a new line in the foliage as this had the best grip and you could rip around the bottom corner. However there were so many line options which would have made it good fun in the dry. From there it was a case of hang on and let off the brakes as you slid through the corners. It really was a lot better if you didn't brake and just kept the wheels rolling. There was quite a bit of counter steering to be done though. I managed to ride the descent clean mostly in the race, although the first lap was far from clean, as I followed Ash Hough (on summer tyres) down there and he was skating down there, I followed suit. There was one slightly more technical corner on the descent, which involved an off camber entrance which directed you invariably towards a large tree around which you had to corner. The corner itself had a few roots in it and little drops over them, but nothing too bad. On the exit you had the choice of 2 bridge lines, either right and around a slower line, or straight on, dropping off the bridge (about 2ft, only little) and then trying to turn. The drop line was a lot faster and it certainly seemed easier to me. Just to prove that I can ride the descent, here is a photo from the same place as the skating photo (just below that rooty corner). From here it was relatively untechnical, a singletracksingletrack, with some fun kinks, which led to a wooden berm (which was just wrong if you ask me, tree too close on the apex to really lean in, and the boardwalk was stepped instead of smooth throughout the arc) preceding the final climb of the lap. This was a singletrack climb through grass instead of the forest of the other climbs. By the race one of the corner had become very cut up and I only mastered it on the 3rd attempt. A bog on the exit that sucked your wheel in required the correct line in and out of the corner and some clever body positioning. From the top of the final climb the course crossed the road and onto more wide gravel track switchbacking/traversing down to the main field set-up. From here you had a view of the finish and a good 1k of the course. I was locked out from here to the start finish pretty much as it was mostly flat and untechnical to the end. Having crossed the start finish line you entered the first woods section (I know this seems out of order, but this is the way I rode on practice, so you will have to indulge my minds little foibles) with a long right hander that could pretty much be sprinted at. The descent that followed was bermy fun, but as usual braking bumps where building up meaning that some of the corners were best ridden without braking and manualing into them whilst relying on the bumps to slow you down enough to rail the slippery (clay based) corners. You then (in the same wood section; Forrester Park) climbed gently back up to the BMX car park before traversing the slope down to the BMX track and hitting gravel then crossing the road. The additional section for the race turned out to be the main climb, a firebreak drag of a few minutes in length. I danced up this on the first lap, but calmed down for the rest of them, I potentially should have smashed it up here out of the saddle every lap, but knowing that I didn't have great strength I decided I would play it safe and make sure I didn't cramp. The descent that led to the technical section was good fun, fast and fairly flowing, a few little drops into corners and one really slippery corner to keep you awake, but mostly good recovery from the climb up. So the actual VFTP! I started well enough, having had a good warm up and done all of the prep that I needed to. I was positioned mid to rear-mid coming through the start finish (you started on the field below the main arena field and climbed back to the start/finish using the tail end of the main lap), but made a move on people up here before following through the woods. I moved up some more on the main climb, attacking as hard as I could and making it back up to Ash Hough who had used his fast tyre advantage on the grassy, grippy opening section. I followed Ash's wheel up the technical climb, but had to run a large section before 'skating' down the descent but managing to overtake Ash somewhere down here. The rest of the race is pretty much a blur of pain and fun in pretty equal measures. Suffice to say I ate well (3 full Peak Fuel gels) and drank well throughout the race which allowed me to ride hard all the way. I was taking places every lap apart from the last lap, but still finished with a fairly strong last lap, although Gav was catching me on that final lap. In the end I finished 11th, with Gav just behind in 12th. I was really pleased to beat Gav and Paddy Avery, and (without sounding like a footballer) I think I gave it everything I had. It certainly felt like I had the next day anyway! 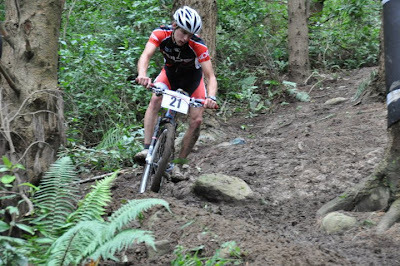 All in all a good weekend, 11th in the NZ national champs without doing any real training. Meeting loads of cool people, and generally having some fun! We went to watch the short course and DH the next day, sadly Gee Atherton crashed out up the top, but I got some nice photos of people doing some jumps, so I was happy! A few nights out relaxing with people definitely added to the whole week. It was certainly sad to say goodbye to people, but it gives me even more reason to come back in the knowledge that I have good friends here. P.S. I forgot in the original post to thank Thomas for doing a sterling job with my bottles, first time he had done them apparantly, but turned out perfect, so thanks! I will leave you with a couple of those DH photos. The final 'floaty' jump of the Quad. The third jump of the Quad, a nice little hip. Sprinting between the jumps, looking out from Signal Hill over Dunedin. Love reading your blog,you are such and eloquent writer.